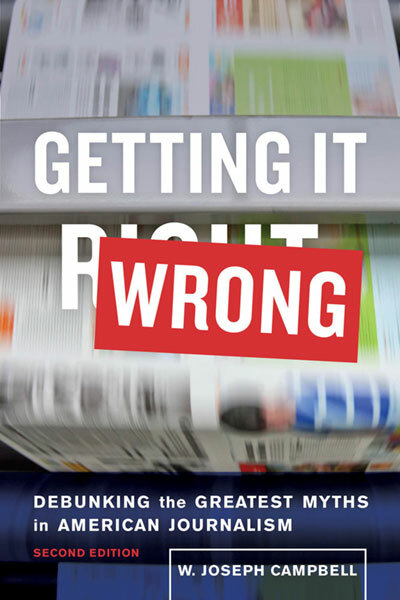 The award-winning book, Getting It Wrong, confronts and debunks prominent media-driven myths, including several of the most cherished stories American journalism tells about itself. Media-driven myths are well-known stories about and/or by the news media that are widely believed and often retold, but which, under scrutiny, prove to be false or wildly exaggerated. A new and expanded second edition of Getting It Wrong addresses the first Kennedy-Nixon televised debate in 1960, the "Napalm Girl" photograph of the late Vietnam War, and bogus quotations driven by the Internet and social media. "Every journalism student and reporting teacher should study Getting It Wrong, in which Joseph Campbell ... separates the myth and legend from reality in ten legendary news stories. He presents extensive documentation to support his analysis." Listen to the author's discussion about media-driven myths, including the notion that Walter Cronkite's 1968 report on Vietnam altered U.S. public policy, turned public opinion against the war, and prompted President Lyndon Johnson not to seek reelection.